As you tuck into your tasty chocolate Easter eggs this weekend, you may ponder on the significance they have on this most important of Christian feast days. The custom of giving eggs at Easter celebrates new life. Christians remember that Jesus, after dying on the cross, rose from the dead. This miracle showed that life could win over death. When Easter was first celebrated, Christians adopted the egg symbol with the broken shell of the egg compared to the opening of Jesus’ tomb during his resurrection. This, in turn, symbolises the rebirth of mankind. The tradition may also have been developed for practical reason, as it was customary for Christians to abstain from eating eggs during Lent. Since eggs are easier than many foods to preserve without refrigeration, they were often eaten to break the fast on Easter Sunday. No one actually knows when eggs were first used as symbols at festival times but it was long before Jesus' time. Eggs were always thought to be special because although they do not seem alive, they have life within them especially at springtime when chicks hatch out. Though chocolate eggs are a very modern custom, decorating eggs actually predates Christianity with some of the earliest examples being engraved ostrich eggs found in Africa dating from 60,000 years ago. However, the Christian custom could well have pagan origins. In Christianity, the egg symbolises the rebirth of Jesus but they have long had this significance in pagan festivals and spring celebrations. So just when and where did Easter eggs turn chocolate? The first sweet eggs to be eaten were made from sugar or marzipan. Chocolate eggs first made their appearance in France and Germany during the 19th century. However, it was the John Cadbury in England who helped populised the chocolate egg, in 1875. Cadbury’s first eggs were made out of dark chocolate but milk chocolate incarnations were launched in 1905 and soon became bestsellers. 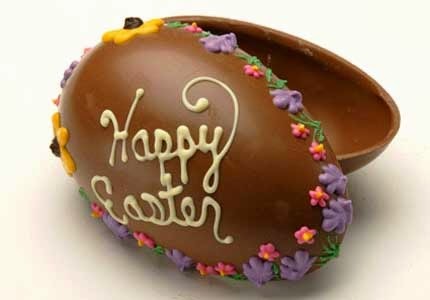 Today, chocolate Easter eggs are to be found all over the world. However, what they represent is lost on many people.